Ramayana traditions in Tamil Nadu can be traced back to early Tamil literatures of the Sangam canto [300 BC – 250 AD] such as Agananuru and Purananuru. These compilations quote indigenous events and sequences [Agananuru No. 70, Purananuru No. 378] not found in the Sanskrit version of the epic by Sage Valmiki, suggesting early percolation of Ramayana ethnicities in peninsular India through folklore and other oral/cultural traditions. Literatures of the post-Sangam period [250 – 400 AD] contain increasing references to Ramayana’s events and characters. A propensity to identify Rama as a manifestation [Avatara] of Lord Vishnu, thereby elevating his status to Godhead - is observed in this period. The Silappathikaram of Ilangovadigal, for example, places Rama in line with other incarnations of Vishnu like Krishna and Narasimha [Pukar Kandam, Sec.9 Lines 9-13]. The concept of Ramavatara is further enriched and elaborated in the Tamil devotional couplets of the Vaishnavite Alwars, in the Pallava-Pandiya period [580 – 894 AD]. Kamba Ramayanam, the earliest extant version of Ramayana in Tamil by poet Kamban [12th Century AD], was titled Ramavatharam – following this tradition. Epigraphic material retrieved from copper plates and inscriptions of the Pallava-Pandiya period attest the continuing influence of Ramayana in Tamil society. For example, the Kasakkudi Plates of Pallava emperor Nandivarman-II eulogizes his predecessor Narasimhavarman-I as the “victor who undermined even the great glory of the valor of Rama who triumphed over Lanka” [Sivaramamurthi, C. 1983:184]. Endowments were provided by rulers for the recitation of Ramayana in public. However, Ramayana themes were not widely adopted for sculptural representations in temples. For the first time in the art history of Tamil Nadu, Ramayana depictions - as a series of narrative miniatures, are observed in the early Chola temples of early 10th Century AD in the Cauvery valley. The Nageswaraswami temple at Kumbakonam, Thanjavur district. The Brahmapuriswara temple at Pullamangai, Thanjavur district. The Sadaimudinatha temple at Tiruchennampoondi, Tiruchirappalli district. The Nalthunai Iswara temple at Punjai, Nagappattinam district. The Samavediswara temple at Tirumangalam, Tiruchirappalli district. This scope of this series is to understand the sociological, cultural and artistic influences of Ramayana in the Tamil society during Chola times - by comparing, contrasting and comprehending select miniature reliefs from these temples. The great sacrifice of King Dasaratha, which sets the story of Rama in motion, is portrayed in few temples like Kumbakonam and Pullamangai. At Kumbakonam, the sacrificial Alter [Homakunda] is shown approximately in the middle of the relief and a celestial Goblin [Bhutagana] is seen emerging from the top of the fire. He is holding an object of veneration on top of his head. This object, which seems to be wrapped up in a cloth, is obviously not a vessel containing Payasa as in Valmiki but most probably the Pinda of Kamban’s Ramavatharam. King Dasaratha, standing to the right of the Alter, is keenly extending his hands to receive the celestial gift from the Gods. His slightly bent posture reflects his anxiety and urge to receive the gift. He is wearing a Makuda and Patra Kundala and is draped in a silk loincloth. His chief Queen [Pattamahishi] Kausalya is standing next to him, witnessing the event. Sage Rishyashrunga (the Antelope headed one / Kalaikkottu Munivan in Tamil), who is the chief priest of the sacrifice [Yagna], is shown to the left of alter. His Gradudasana posture signifies the spirit of offering. Holding a sacrificial ladle [Sruk /Sruva] in right hand, he is offering ghee to the fire. Two of his attendants are seated behind him and a third one is shown on the other side of the Alter. Four characters are shown standing in the background. Two of them are Sages [Rishis] and the other two are celestials [Devas]. The Rishi pair is involved in a conversation. The right hand of first Sage is held in Vismaya posture – in praise of the sacrifice. The other Sage, listening to his companion with due attention – is engaged in playing a stringed music instrument. The celestials witnessing the sacrifice are Surya and Chandra – as suggested by the nimbus behind their heads. These four characters, taken together, could represent the celestial gathering witnessing the sacrifice. At Pullamangai, the position of the King is shifted to the left of the Alter. Here, he has already received the celestial gift from the Goblin who is seen in the midst of the fire. Once again, the object being exchanged cannot be identified with certainty but it doesn’t seem to be a vessel and most likely to be the Pinda – as seen earlier at Kumbakonam. Two male figures are seen behind the King; the first figure is holding a flower in his left hand and is looking at the second one. The second figure is holding a sword, which is resting on his left shoulder. These two figures represent attendants of the King. Queen Kausalya is conspicuous by her absence. The priests who are conducting the sacrifice are located to the right of the Alter. The chief priest is in Garudasana posture and he is not Sage Rishyashrunga; the second priest is a supportive figure. One sage and three celestials are seen in the background, witnessing the sacrifice. One of them, located right above the Alter, is holding an object in his right hand - the identity and purpose of which is unclear. Significant variations in treatment are observed between the two Chola Ramayana panels of comparable age, depicting the same theme, viz. 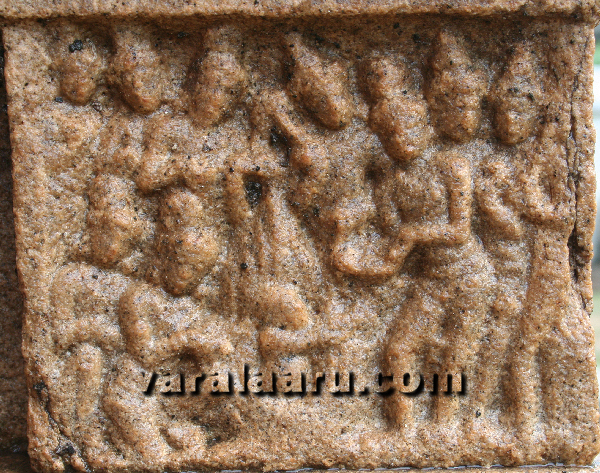 the Sacrifice of Dasaratha. The representation at Kumbakonam includes one Goblin, two performers of the Sacrifice (the King and the Queen), four conductors (Priest and his companions) and four celestial witnesses. Altogether there are 11 characters and all are male figures except one. At Pullamangai, the portrayal includes one Goblin, one performer (the King), two of his attendants, two conductors and four celestial witnesses. There are 10 characters in total and all are male figures. The absence of Kausalya and Rishyashrunga at Pullamangai is nonconforming. The Queen has been replaced by two attendants who are standing behind the King [one of them seems to be a guard of honor or Tirumeikkappu]; and the role of Rishyashrunga is taken over by another Priest. Either the sculptors preferred not to portray the said characters or more likely there were other recessions of Ramayana in vogue during Chola times that did not include the two. In both reliefs, the focal theme is the sacrificial Alter and the emergence of the Goblin. At Kumbakonam, he emerges over and above the fire while at Pullamangai he is seen inside the fire. The object being presented is carried over the head by Kumbakonam Goblin, which is not the case at Pullamangai. In both reliefs, the Sages are the only characters involved in talking and probably singing [Vachika]. Only the chief Priest is directly involved in the sacrifice while the rest of the crew is just observing or chanting the holy Hymns [Mantras]. 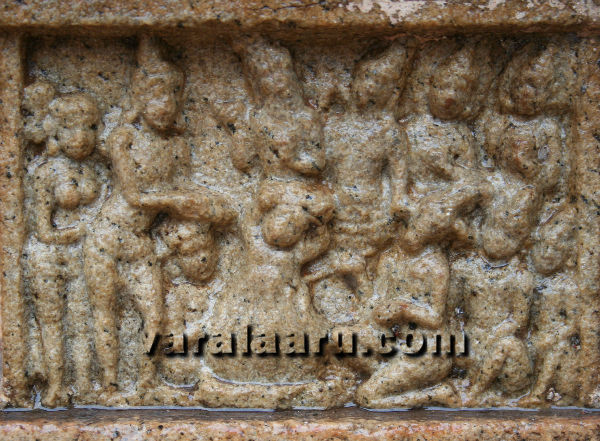 Among the two reliefs discussed, the one at Kumbakonam is the finest wherein several characters are accommodated with ease within a single miniature frame and yet the composition is fully balanced.